The Dragon spacecraft has separated from its second stage and achieved its preliminary orbit. Dragon’s solar arrays have deployed and will provide 5 kilowatts of power to the spacecraft as it begins a carefully choreographed series of thruster firings to reach the International Space Station. At 7 a.m. EDT on Friday, April 17, the Dragon spacecraft will catch up to the orbiting laboratory, and Flight Engineer and European Space Agency Astronaut Samantha Cristoforetti and Expedition 43 Commander Terry Virts will use the station’s 57.7-foot (17.6-meter) robotic arm to reach out and capture it as they operate from the station’s cupola. Research that will help prepare NASA astronauts and robotic explorers for future missions to Mars is among the two tons of cargo now on its way to the International Space Station (ISS) aboard SpaceX’s Dragon spacecraft. 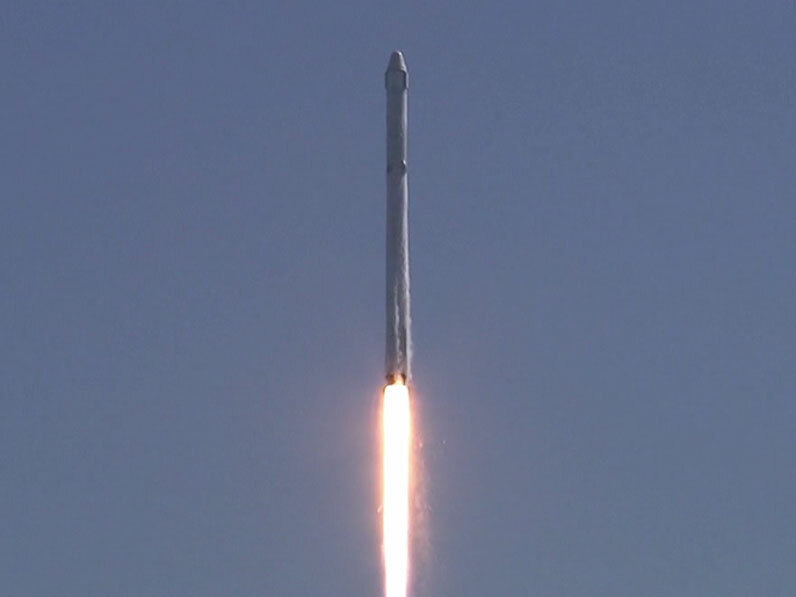 The spacecraft launched on a Falcon 9 rocket at 4:10 p.m. EDT on Tuesday from Space Launch Complex 40 at Cape Canaveral Air Force Station in Florida. The Cell Shape and Expression research program will provide for the first time a reliable experimental model able to highlight the relationships between microgravity, cell shape and gene expression, which may also inform pharmacological ways to counteract microgravity-induced cell damages. Osteo-4 studies the effects of microgravity on the function of osteocytes, which are the most common cells in bone. These cells reside within the mineralized bone and can sense mechanical forces, or the lack of them, but researchers do not know how. Osteo-4 allows scientists to analyze changes in the physical appearance and genetic expression of mouse bone cells in microgravity. Dragon also will deliver hardware to support an ongoing one-year crew study known as Fluid Shifts. More than half of American astronauts experience vision changes and alterations to parts of their eyes during and after long-duration spaceflight. The Fluid Shifts investigation measures how much fluid shifts from the lower body to the upper body, in or out of cells and blood vessels, and determines the impact these shifts have on fluid pressure in the head and changes in vision and eye structures. Robots can perform tasks too repetitive, difficult or dangerous for humans. Robots built with synthetic muscle would have more human-like capabilities, but the material would have to withstand the rigors of space. This investigation tests the radiation resistance of an electroactivepolymer called Synthetic Muscle, developed by RasLabs, which can contract and expand like real muscles. The spacecraft also will deliver hardware needed for the installation of two International Docking Adapters scheduled for delivery on future SpaceX missions. Once installed, these adapters will enable commercial crew spacecraft to dock to the space station. ESA (European Space Agency) astronaut Samantha Cristoforetti will use the space station’s robotic arm to grapple Dragon to the station at 7 a.m. Friday, April 17. Expedition 43 Commander Terry Virts of NASA will assist. After about five weeks, Dragon will depart the space station for a splashdown in the Pacific Ocean west of Baja California. The capsule will return more than 3,000 pounds of science, hardware, crew supplies and spacewalk tools. The International Space Station is a convergence of science, technology and human innovation that enables us to demonstrate new technologies and make research breakthroughs not possible on Earth. It has been continuously occupied since November 2000 and, since then, has been visited by more than 200 people and a variety of international and commercial spacecraft. The ISS remains the springboard to NASA’s next giant leap in exploration, including future missions to an asteroid and Mars. Why not recover the first stage of a alcon 9 the way NASA used to recover SRB’s used for a Space shuttle launch? his method makes sure each rocket stage nwould need a thoreugh clean-up after recovery, but the change of major damage to the rocket stage would be much smaller than when you try to land one on a flaoting platform.